Vijayawada has a unique position in the politics of Andhra Pradesh. Vijayawada is particularly cruel to AP politics. In many cases the consequences of the events here affect the entire state,it is proven .That is why political parties are crucial to winning assembly seats in Vijayawada. Vidipatiya's attempts to retain the latest in Vijayawada ... TDP's strategies to keep silence have changed. With the entry of the former MLA of Vijayawada Eastern constituency joining the Vajpayee ... he is once again claiming to contest from the eastern constituency. The same is true that the political battle in Vijayawada Eastern constituency is likely to be a horn of war. As Yalamanchili Ravi and Gadde Ram mohan both belong to the Kama community, it is interesting that the fight between the two would be interesting. In fact, in the next election, Vijayawada should move from one location to another. He said that he had told Chandrababu that he had responded positively to the case. However, this time from YSR, Yalamanchili came into the field ... TDP sources think that his rival Ram mohan was in the race again. Ram mohan, who has a good name among the public, has been promoting the Yalanchandi Ravi. There is no doubt that Vijayawada East politics will become even more interesting with the Ravi entry as a whole. 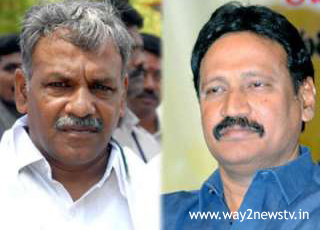 However, Bezwada thinks that it is not easy for Ravi to win the place if Rammohan is in the field.